This photograph depicts an approaching dust storm in Morton County, Kansas, during the 1930s. 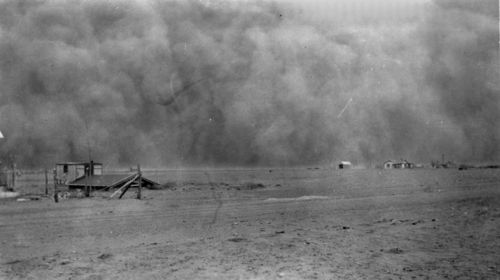 Morton County, in the southwest corner of the state, was among the hardest hit areas during the Dust Bowl. Dust storms, such as the one depicted here, could blow for a full day, coating everything in their path with a layer of dirt. This source works in tandem with other photographs depicting dust storms, as well as written accounts of dust storms that have been selected for this standard. Note that the building in the foreground appears to be almost completely buried by dust.